This is taken from a purchased and registered National Geographic program. 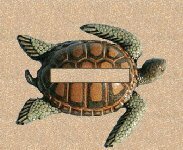 As such the information and pictures contained are copyrighted by them. This particular article was written in June of 1994, by Michael Parfit and David Alan Harvey, except where I have chosen to write in any of my own comments. 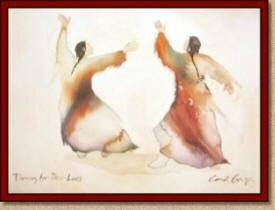 During Oklahoma City’s Red Earth Festival, “Comanche John” Keel joins in Tradtional Dance. 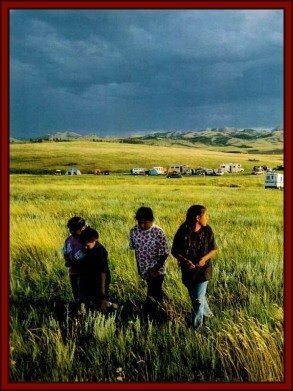 Grand Entry at Rocky Boy Reservation in Montana. 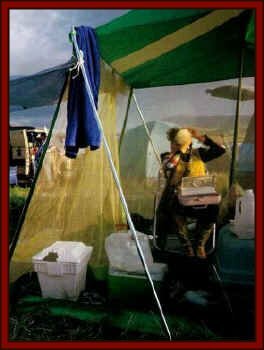 Ed Blackthunder, a Sioux from Agency Village, South Dakota puts final touches on his Traditional Dance outfit at Rocky Boy. 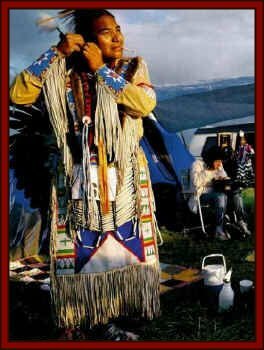 Below, his wife, Oriann Baker, affixes her Eagle plume which is held in reverence by all Native Americans. 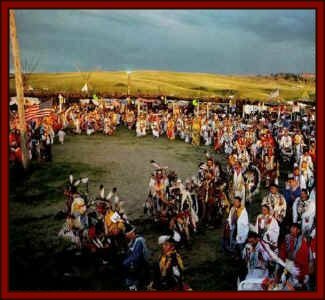 Anyone with an ear to the ground, can tell that Powwows are gaining popularity not only due to a long needed upsurge in Native American Pride, but also due to the search by non-Native Americans seeking something of worth since much of their own “old values” seem to be falling by the wayside, be it spiritual or whatever. 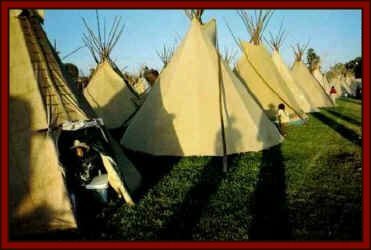 In powwows, there are several categories. 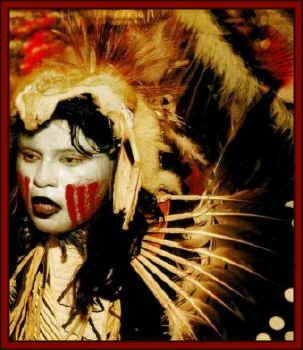 Some of these, such as Men’s Fancy Dress/Women’s Fancy Dress, or Women’s Jingle Dress, while not tradition, are in fact based on traditional dances that were once part of spiritual ceremonies, preparation for war, healing rituals, or celebrations of triumph. 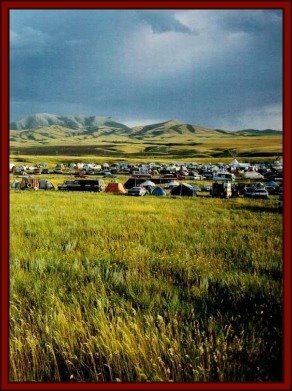 It is said, when this article was written, that there was a book written regarding powwows and listed some 930 of them. I would imagine that nearly ten years later, this number has increased. Kids roam free through an instant village of 250 tepees pitched at the Pendleton Round-up in Oregon. Rocky Boy resident Rena Denn, at right, leads visitors on a tour of her homeland below the Bear Paw Mountains. 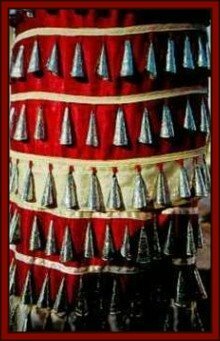 To put the jingle in the jingle dress, dancers sew silvery cones made from snuff-can lids onto ceremonial outfits. 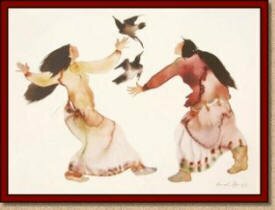 In the old days women used elk teeth, small bones, coins, and cowrie shells as noisemakers. 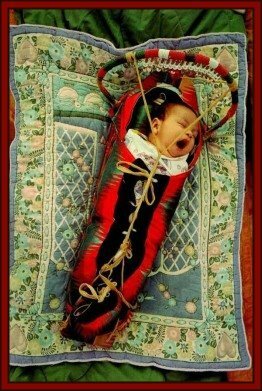 A gentler sound comes from James Winterhawk Seymour’s cradleboard at the annual September Powwow in White Swan, Washington. Beads above his head rustle to alert his parents when he awakes, as well as lull him back to sleep.